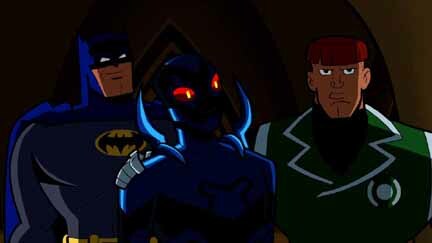 BATMAN: THE BRAVE AND THE BOLD: "REVENGE OF THE REACH!" Warner Bros. Animation has released three videos and 17 stills from "Revenge of the Reach," the Friday, Jan. 1 episode of Batman: The Brave and the Bold on Cartoon Network. For a clip from the teaser, featuring the Challengers of the Unknown, CLICK HERE. For a clip, featuring Blue Beetle, CLICK HERE. For a clip, featuring Blue Beetle and Guy Gardner squaring off, CLICK HERE. "Blue Beetle is finally ready for a mission of his own and things go smoothly until he tries to deliver his captured villain to Oa, where he is attacked by the Green Lanterns! Blue's scarab is revealed to be linked to an army of evil aliens known as the Reach -- does he have the power to resist their influence?" Fox has released eight images "Getting Closer," the Friday, Jan. 8 episode of Dollhouse. * Adelle realizes the key to adverting a devastating future is to restore Echo's original personality and memories. * Bennett is brought in to help Topher restore Echo's original personality and memories. * Adelle and Topher share a debilitating experience. * Dr. Claire Saunders returns. Click on the thumbnails for larger images and look for more Dollhouse news on Saturday here in The Continuum. Image Comics has released its solicitations for March. For a rundown, with images, CLICK HERE. * Dynamite Entertainment has announced an April release for Buck Rogers Vol. 1: Future Shock Hardcover, collecting the first arc of the new series. * Sunday, December 20: IDW Publishing First Looks, Brittany Murphy dies and Marvel Comics roundup. * Saturday, December 19: Top Cow Productions First Looks and Zombies vs. Robots. * Friday, December 18: Marvel Comics First Looks, Image Comics First Looks, BOOM! Studios First Looks, Nick Cannon develops Josie and the Pussycats for TV and Angel. * Thursday, December 17: Radical Publishing First Looks, Dark Horse Comics First Looks, Top Cow Productions First Looks, Marvel movie roundup, The Super Hero Squad Show, Astonishing X-Men and Oni Press management shake-up. * Wednesday, December 16: Iron Man 2 trailer, Dark Horse Comics for March, Justice League: Crisis on Two Earths, Radical Publishing First Looks, Archie Comics First Looks, Image Comics roundup and Family Guy. * Tuesday, December 15: Human Target, DC Comics roundup, Image United, Dollhouse, We Will Bury You, DC Comics First Looks, Archaia Comics First Looks, Marvel Comics First Looks, Sherlock Holmes and The Simpsons. * Monday, December 14: Marvel's Greatest Comics, Tron: Evolution trailer, Marvel Comics First Looks, DC Comics First Looks, Top Cow Productions First Looks and Archie Comics for Free Comic Book Day. * Sunday, December 13: Spider-Man action figures and Dark Horse Comics First Looks. * Saturday, December 12: IDW Publishing First Looks and Dynamite Entertainment First Looks. * Friday, December 11: Marvel Comics First Looks, Image Comics First Looks, BOOM! Studios First Looks and Justice League: Crisis on Two Earths. * Thursday, December 10: Iron Man 2 poster, Free Comic Book Day titles, Moonstone Books for April, Radical Publishing for March, Dollhouse, Marvel Comics First Looks and Dynamite Entertainment First Looks. * Wednesday, December 9: Iron Man 2 toys, Jonah Hex's Josh Brolin, Batman: The Brave and the Bold, Batman: The Return of Bruce Wayne, Ape Entertainment's Scratch9, Bluewater Productions First Looks, Top Cow Productions First Looks and Archie Comics First Looks. * Tuesday, December 8: DC Comics roundup, Marvel Comics roundup, Radical Publishing First Looks, Archaia Comics First Looks, DC Comics First Looks and Dynamite Entertainment First Looks. * Monday, December 7: Watchmen on HBO, Marvel Comics First Looks, Dynamite Entertainment First Looks, DC Comics First Looks, BOOM! Studios First Looks and DC Comics roundup. * Sunday, December 6: Cartoon Network episodes and Dollhouse. * Saturday, December 5: BOOM! Studios First Looks, Image Comics First Looks, Harris Comics First Looks and Oni Press First Looks. * Friday, December 4: Jonah Hex, The Losers, Marvel Comics First Looks, Batman: The Brave and the Bold, Dynamite acquires Dabel Bros. titles. * Thursday, December 3: Marvel Comics First Looks, Star Wars: The Clone Wars, Dark Horse Comics First Looks, Top Cow Productions First Looks and J.T. Krul talks Minefield. * Wednesday, December 2: Justice League: Crisis on Two Earth's Chris Noth, DC Comics First Looks, Archie Comics First Looks, The Super Hero Squad Show, Family Guy, The Simpsons and Dollhouse. * Tuesday, December 1: Iron Man 2, Batman: The Brave and the Bold, The Super Hero Squad Show, Bluewater Productions for March, The Impaler and Archaia Comics First Looks. * Monday, November 30: Iron Man 2, Marvel Comics First Looks, Dynamite Entertainment First Looks and DC Comics First Looks. * Sunday, November 29: Heroes and Antarctic Press for February. * Saturday, November 28: Oni Press First Looks and Dark Horse Comics First Looks. * Friday, November 27: Wolverine and the X-Men, Devil's Due Publishing for February, Ape Entertainment for February and Mirage Studios for February. * Thursday, November 26: BOOM! Studios First Looks, Image Comics First Looks, Dollhouse, Iron Man: Armored Adventures and Aspen Comics for February.